My recent painting of this iconic mountain. Many years ago when my children were small I was camping with the family near here. One morning on emerging from our tent we were greeted by this stunning sight. I had climbed the Ben before but never had a view. We packed up and raced over to Glen Nevis, pitched camp and I climbed the Ben by the north face and was rewarded with stupendous views. Next day it was still clear and Jo climbed it while I looked after the children. Next day it was STILL clear so I climbed it with Edward who I think was 9 or 10 at the time, a great achievement for him. Three clear days on the Ben is not usual so we were very lucky indeed. Wonderful memories. I will probably not sell this painting as it will always bring those memories back. Wind in the Willows perhaps? I hope she feels it too. I recently attended a fourteen day Buddhist Retreat over Christmas and New year. If you are planning such a retreat here are some tips on surviving it. First learn to eat fast. There is a spiritual inner man and a spiritual outer man. Feed the latter to connect with the former. The food is excellent but portions are small so there is a race to clear plates in order to obtain seconds which are limited. You could miss out! In this retreat there were ten days of complete silence so be selective who you talk to in the preceding two days. Avoid obvious dharma bores and it is wise to avoid any stranger wearing a Kesa ( a sign of an ordained Buddhist ) because although they will be lovely they will have a funny ordained name which you will forget after ten days silence and therefore risk giving offence. These names are confusingly similar, such as Dharmayeti, Dharmadippy, Pranjapringle, pranjameetup and so on. Best stick to those still sporting a normal name like John, Paul, George etc which are easier to recall. Especially avoid anyone wearing a Kesa, a pony tail and bare feet. This is a serious statement and conversation with this individual will probably be about Siddhi powers and he will aspire to emulate Tibetan monks who can dry a wet robe with body heat while meditating in a blizzard. He will probably also have a cold. Bare feet in December!! Talking of colds try to spot early who has one, you can then avoid sitting next to them in the shrine room. Also as seating in the dining room is pretty random, identify and avoid a table with those so afflicted. 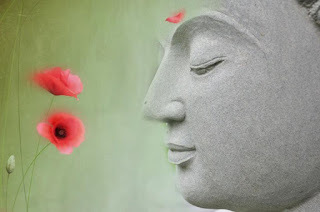 Of course it is important to feel Karuna ( compassion ) towards them, but at a safe distance. Silence is golden but TEN days! To remind yourself how golden, sneak off in your car for half an hour and turn the radio on full blast. This being Christmas you will probably hear Slade’s Merry Christmas and other such oldies. I am sure you will hear these being played at Christmas in your next life time too! Safely reminded rejoin the retreat. In serious retreats, each day will end with ritual and chanting. If this is the sevenfold Puja this is bearable and even quite pleasant. However this can sometimes be expanded in which case you may find your Metta ( loving kindness ) slipping somewhat and you may even lose your Upekkha ( equanimity ) so distract yourself by speculating who won Strictly Come Dancing or how the final episode of The Bridge finished. Oh and for a New Years resolution resolve to spend next Christmas with your family! With apologies to my Buddhist friends for this light-hearted take on a retreat. If you didn’t smile you may be missing the point! With Metta to all.